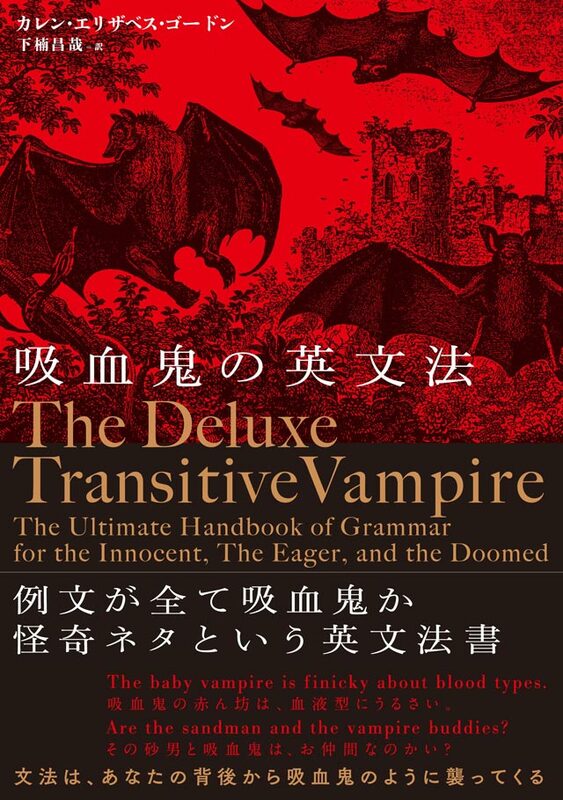 A very unique book was translated into Japanese recently, called The Deluxe Transitive Vampire: The Ultimate Handbook of Grammar for the Innocent, the Eager, and the Doomed. From that title alone, you can probably tell this isn't your grandmother's grammar resource (unless she was a member of the Addams Family or something—either way, I won't judge). The robot you've been sending flowers to is wearing his heart on his sleeve. The nymph who left these footprints is usually much more cautious. If I die first, will you tuck me into my casket? If you've been looking for unique sentences to study from, this book is a goldmine. You get to read about English grammar explanations in Japanese, too, which I think is pretty interesting. And because it's a translation of an English grammar book, you can always purchase both and use them side by side to simultaneously improve your Japanese and English grammar. The second volume covers 1,208 new kanji, 1,660 example sentences, 2,900 words and phrases, and tons of mnemonics to remember them all. 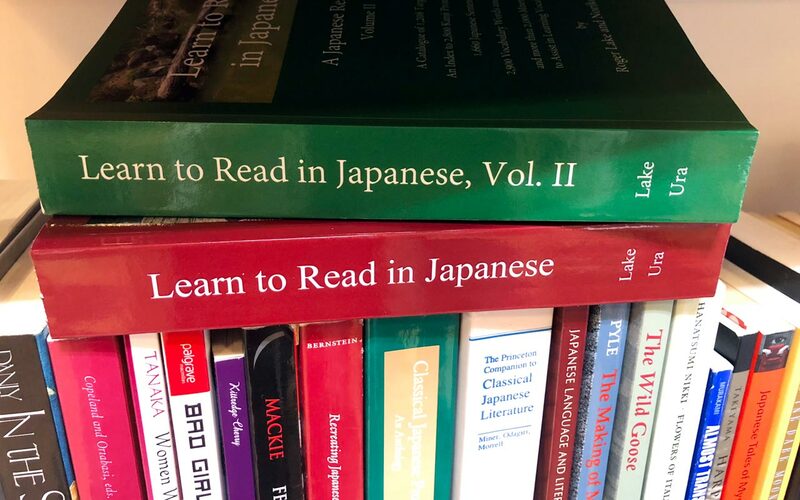 In our very first article in this series, we covered Learn to Read in Japanese, Volume I by Roger Lake and Noriko Ura. Now, a year and a half later, they've released Volume II! The second volume covers 1,208 new kanji, 1,660 example sentences, 2,900 words and phrases, and tons of mnemonics to remember them all. Just like Volume I, it's huge and chock full of really great information. Each chapter teaches eight target kanji with related vocabulary words, and each vocabulary word has a mnemonic story to help you remember the reading and meaning. There are also a few additional vocabulary words, using kanji previously learned in volumes one and two, with their own mnemonics. Finally, there are practice sentences using the target vocabulary, with romaji breakdowns and literal English translations. If you've been looking for reliable, accurate Japanese sentences to study from, there are thousands to choose from. Certainly you can rely on him. He checked the documents meticulously. Another new and unique feature of Volume II is that it offers compatibility with Satori Reader (another resource we've discussed before). After completing certain chapters of the book, there are optional instructions guiding you to the Satori Reader chapters you should read for supplemental practice. Some of the vocabulary taught in Volume II is also specifically there to support your ability to read Satori Reader articles better. There's even a secret code for Satori Reader that you can get from the book. 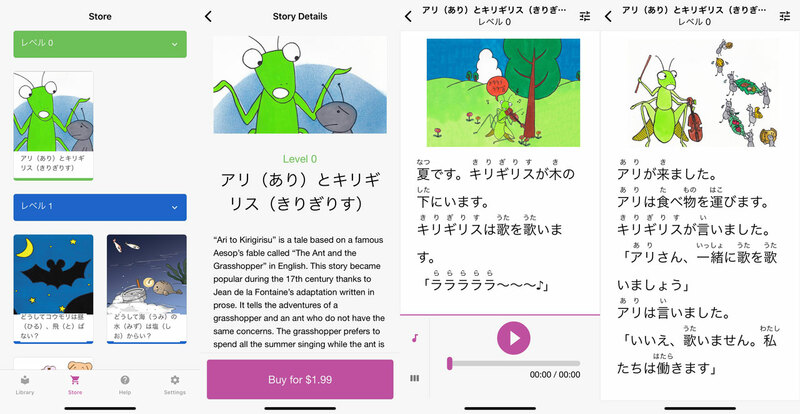 White Rabbit Press just released a new app to support their short graded readers called Japanese Graded Readers. All nine of their graded readers, ranging from levels 0–3, are available for purchase individually via the app. Each page has its own art as well as slow audio read by a native Japanese speaker. The audio can be set to autoplay as you read through each story. All kanji and katakana has furigana, and there are three different settings for font size. The same words and patterns repeat as you read the story. That way, instead of trying to look up every other word on the page, you should be able to learn any new words through context. Because the goal of these readers is to have you reading and understanding Japanese stories earlier than you would with native material, the words and grammar are quite simple. And while there are no English translations or vocabulary lists provided with each reader, each word should be simple enough for anyone to look up in a dictionary. So far, there aren't many options for customization (we'd love it if you could turn the furigana off or select individual words for a Japanese gloss), which could help warrant the prices of each story. But if you've been struggling with getting into reading in Japanese, these could definitely help bridge the gap. The level 3 and 4 stories are aimed at JLPT N4–N2 as well, so there's something for almost everyone. 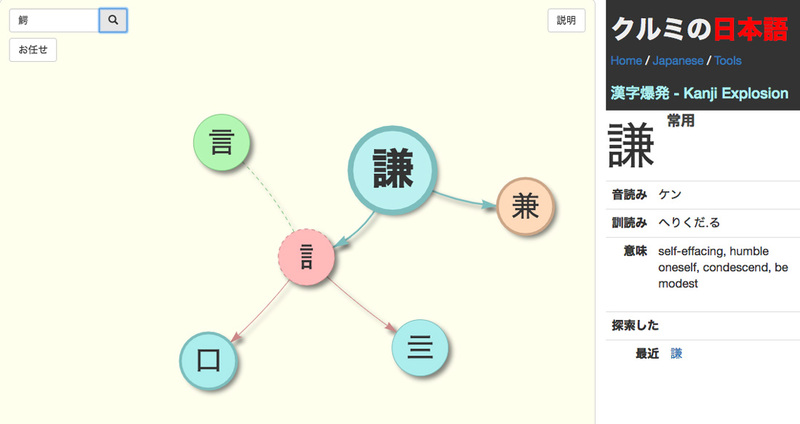 Kanji Bakuhatsu is a neat site that you can use to visually understand the components of kanji. This is basically like Suiren (a resource we covered a few months back), but backwards. 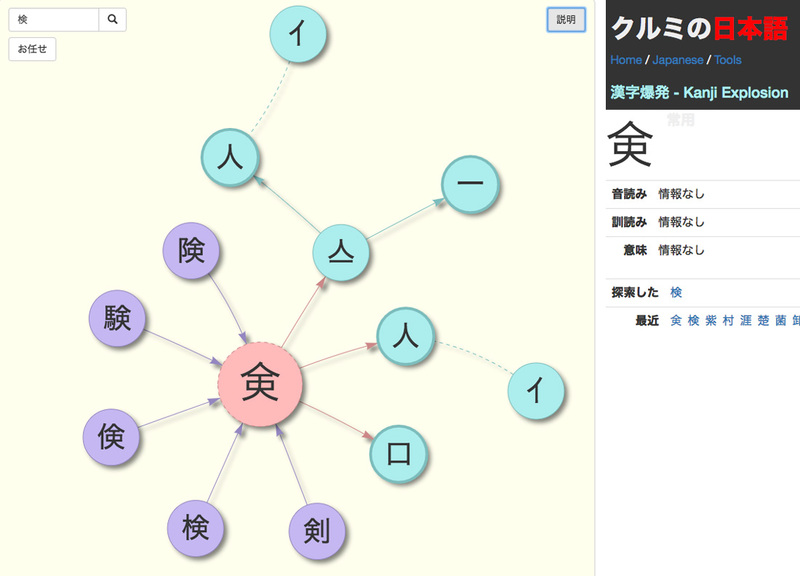 Instead of exploring what vocabulary words a kanji appears in, you can see what kanji parts appear in multiple kanji. While this is more for aesthetics and good ol' fashioned educational fun than true studying, there are some cool things you can discover when you're looking up kanji radicals and their parts. A cool map of kanji that also use that component, as well as the bits that make up the shape of the component itself. Clicking around on those kanji pulls up the dictionary meanings and readings and… you'll discover all of these kanji have the same on'yomi reading: けん! Very cool. 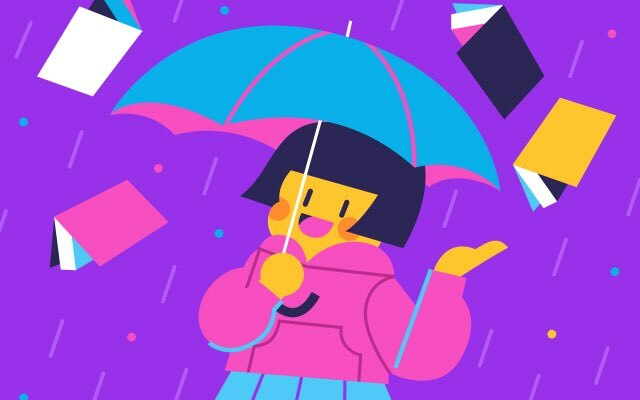 If you're the type of person who likes to see things mapped out, if that helps you remember things better, this site is a really fun rabbit hole to lose yourself in. The show has English and Japanese subtitles, so if you miss a joke, it's easy to switch between languages to check. Gaki no Tsukai isn't coming to Netflix (how dare you, Netflix, do it already you cowards), but a dramatized "documentary" of sorts about frequent cast member Hideaki "Jimmy" Onishi came out this month. It's called, "Jimmy: The True Story of a True Idiot." Before you rush over to Netflix, beware! Jimmy is a show about a really simple guy who has trouble understanding many basic things. It centers around his misunderstandings, and the antics that occur around him and the other comedians. I want you to make the floor so clean, you can lick it. He actually licks the floor after each wipe, because, well, that's what he was told to do. Technically. The show has English and Japanese subtitles, so if you miss a joke, it's easy to switch between languages to check. And you can learn a lot about Jimmy's life and laugh a lot while you learn. Sometimes numbers are hard, especially numbers in a language you're trying to learn. Numerals are great, because they're the same in every language, but what if you need to write a really big number in kanji or say it out loud, and you aren't sure if you're right? This little website will convert any number from 1 to 999,999,999 into kanji, hiragana, and romaji. It's as simple as that. But for people who have trouble with numbers and math, sometimes you just need to double check your work, you know?